We met the first week of my freshman year at a Sigma Pi party. We were introduced by Eli’s fraternity brother who went to high school with me. The crazy thing is, we grew up about 30 minutes from each other and had some of the same friends, but we had never met until I moved to Magnolia! Eli was involved in the agriculture department and the Sigma Pi fraternity so we attended a lot of functions hosted by the two organizations. We did the usual dates around town. We would also go fishing with some of his buddies at Lake Columbia or other area ponds. There were numerous trips taken to Doc’s Seafood in Garland City. We started dating in 2006, so this September marks 10 years! 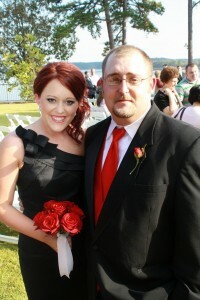 We were married in December of 2011 at Old Washington State Park. We made a ton of memories on that campus. Every time we visit friends in Magnolia, we always reminisce about our days at SAU.